Lots of cool ideas are being tossed around like so much pizza dough. 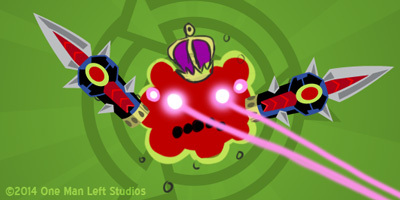 We had a few long discussions on how different weapons could take center stage like we did for brimstone, spitballed some new weapons, and even came up with some weird modes without any weapons at all. Two rough-but-playable demos have been assembled for our strongest candidates (One by ME, and I can’t even code! Thanks Unity! ), and we’re just about ready to commit to one of them. We’ll probably be ready to announce what it is in a few weeks. Another good idea sprung up from our conversations: we may be adding a “hard mode” toggle to Brimstone Pinball & the 2nd DLC, similar to the “Old School” toggle for Classic and Code Red. Alex would like to die faster. Not sure why we haven’t thought of this sooner. Did you use Unity for anything else in the game? @Chemoeum: We actually used it for all of TtL 2. It’s the reason we were able to port to Android so easily. will there be like a beta for the dlc? @mario: There will be. Alex handles who gets in, and that all depends on what devices he needs it tested on and how many slots we have left for testers. If we need new recruits, we usually put out a call here on the blog, facebook, and twitter.